The Hoodwink series is a point and click adventure game developed for the PC. 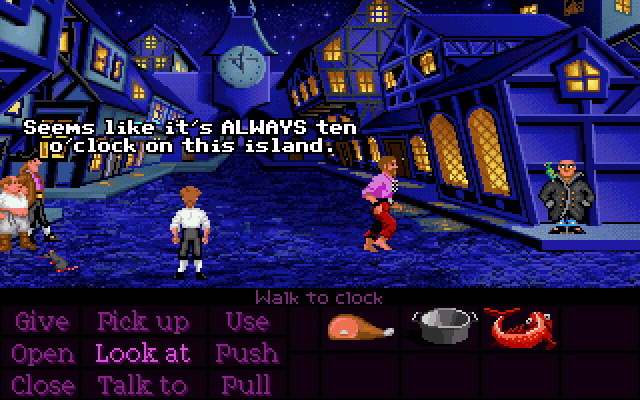 It is a throwback to the old Lucas Art games from the 90s like Monkey Island, Day of the Tentacle and Grim Fandango. The script for the game was already written when I became involved in the project. Being a point and click game, most of the dialogue consists of clicking on objects and cutscenes. The task was to come out with a framework that breaks the script down into chunks which production can then sort it into art, programming and voice recording. First, we have to define all actions which the character can perform in the game world and the number of outcomes which might occur. By listing out the classes, we can then define the initial game state and what happens after the character interacts. Next, we define a “loop” in which the players cannot proceed unless they perform a desired action. Any restrictions the players face during this loop must be justified through the narrative. We start with an extract from the script. Michael arrives at the train station after sneaking through his last stop. He steps out after waiting for the crowd to clear away to avoid getting noticed. While walking past a pay phone, it suddenly rings. The person on the other line gives Michael his next objective. He then leaves the train station. Michael arrives at the station. He hears the payphone after walking past it. If he tries to exit the station, the cops will prevent him from doing so unless he has an approved ID. After talking to the person over the phone, he receives a fake ID hidden in the coin slot. Michael uses the fake ID to get past the cops. Once the core of the framework is done, the writer will then start to write the dialogue for the cut scenes, animators can start with camera work, and designers can start planning for achievements, log entries, check points and other features. After the gameplay and state diagram is good to go, we usually will attach it along with a visual guide.